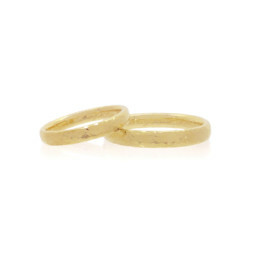 Hammered wedding bands in 18k Fairtrade Gold. These wedding bands were hand-alloyed from scratch and finished with a hammered texture. Ten shades of red, yellow and white gold are available in 18k; four shades in 9k. Rings can be handmade to a variety of profiles and finishes. Hand or laser engraving is also available.